Producer Eli Roth (Knock Knock, Hostel franchise) and director Jon Watts (Spider-Man: Homecoming, Cop Car) team up to bring audiences a haunting twist on the scary clown. 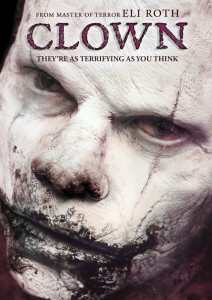 Clown arrives on Blu-ray™ and DVD August 23 from Dimension Films and Anchor Bay Entertainment. From ascreenplay co-written by Watts and Christopher Ford, the film stars Laura Allen (“Ravenswood,” “All My Children”), Andy Powers (In Her Shoes, “Oz”) and Peter Stormare (“American Gods,” “The Blacklist,” Fargo). Clown is a story of a loving father who dons a clown outfit and makeup to perform at his son’s sixth birthday, only to later discover that the costume – red nose and wig included– will not come off and his own personality changes in a horrific fashion. To break the curse of the evil outfit, the father must make grim choices with his own family facing danger.